One fun thing about kindergarten is the scarecrow parade and field trips. Alex makes a beautiful scarecrow. She had fun and Sam said the parade was awesome. Sometimes they actually get along great and enjoy each other. I was very excited to be able to take the day off and spend it with Alex at Dewberry farms with her class. We had a great day just the 2 of us (and several other kids and teachers). It was a perfect day with Alex. She is so fun and friendly. It was fun to see how she interacts with the other kids and adults that were there. She loves socializing and the kids love her. Last week she came home from school and I asked her how her day was and she said " a little bad but mostly good". I asked her what was a little bad and she said, "all the kids wanted to play with no one. They all wanted to play with ME!!!". I could only just laugh to myself. What a difficult day. If all our problems could be that simple. Leave it up to Alex to have this problem. I love this kid. Craziness and all. Some of our great friends our moving and we are very sad to see them go. They moved out of their house and in a hotel right now and we have the great privilege of having Olivia stay with us this week. This past Sunday (Halloween) Harolds and Torbits came over for dinner and we were able to carve pumpkins with friends. Another friend found a great pumpkin kit similar to Mr. Potato head for Michael. We all had a great time with friends and pumpkins. Michael''s made up pumpkin by Morgan's awesome pumpkin. The whole gang. We are sure going to miss the Harolds. Now that we are in a new house, we have taken advantage of decorating (we, or I, started decorating for Halloween since the beginning of September). We have come up with many new decorations (including skulls, bones etc) which the kids are loving. I will post photos when I finish everything. Yes, I am still continuing to finish decorations even though Halloween is over. I will put it away this weekend. As almost every other Halloween, we decided to go dressed as a family. 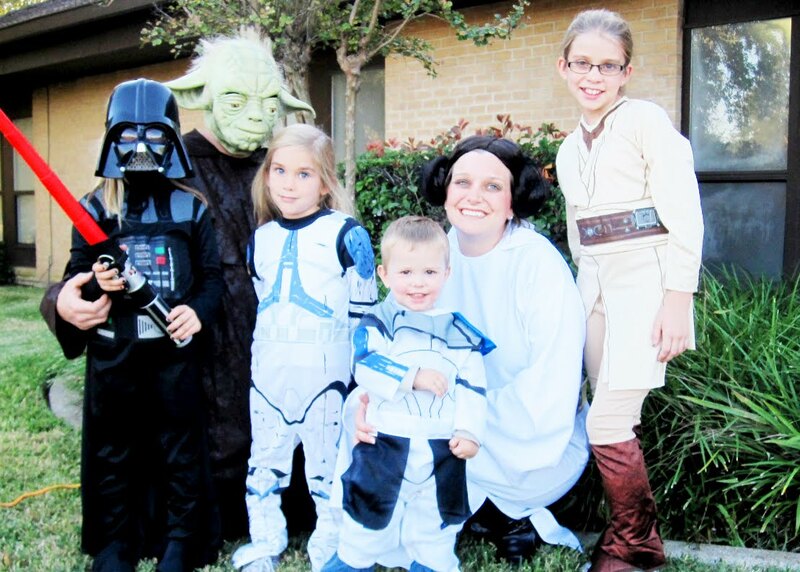 Thanks to some friends who have the same obsession as Chris and children the same sizes as ours, we were able to borrow Chris's dream costumes, STAR WARS!!! Chris makes a great Yoda. The only way it would have been better is if Chris was Darth Vader and Michael Luke was Luke Skywalker so that Chris could say "Luke, I am your father". What Chris helped with and participated in this past weekend. A once in a life time event. All 3 girls were on swim team this season and loved it. They have all become excellent, confident swimmers!!! Alex and Sam enjoyed swimming, but couldn't wait until they got there trophy's at the end of the year. It is amazing what they will do for a trophy. While the girls were swimming, Michael just wondered around and was babysat by many members of the swim team. It's a good thing there are so many eyes watching out for this busy boy. Michael getting into trouble at the awards ceremony. Of course Chris isn't too far behind with the camera. While we sit in the heat, we eat!!!! Michael quite enjoyed his sausage until the girls decided they wanted a bite, then it quickly ended up on the ground as he threw a nice tantrum. Even boys do it. I thought it was only girls, but he has proved me wrong. Morgan and Sam at Meet of Champs. They all did fantastic this year. Morgan, Sam and Alex with their coaches Matt and Jessi. Alex and Sam showing off their great trophy's. Sam also got one of the few sportsmanship awards which we find very ironic. She is the one in our house who is obsessed with games and HATES to lose.!!!!! I don't think I can add enough exclamation marks after that one. Boy did she surprise us on this one and boy does she have the coaches fooled!!! What can we say, we are a very competitive family. Introducing GRACIE LOU (another girl.....dog)!!! My friend, Kim Hicks, had 7 cute, adorable Beagle puppies that she needed to find homes for. She kept bugging me to take one until I finally gave in. I told her that she was just going to have to drop her off when Chris wasn't here so that he just came home to a new dog and couldn't say anything. I started feeling guilty and told him..... a few minutes before she arrived!!! I didn't tell the little girls, so it would be a surprise, and boy was it. Kim showed up with 2 little girls for us to choose from, and Gracie Lou was a perfect fit for the Boyer house. We thought we could test drive her to make sure it worked out with the kids and Katy, and that test drive has turned into a permanent home. Of all people, Chris has fallen in love with her. We have decided that she is Chris and Alex's dog (as Katy is Morgan's dog). Alex loves her as you can see below in the picture. Gracie Lou loves Michael's face due to the many leftovers on his cheeks. Michael just giggles and begs for more. Currently she can fit through the dog door, but who knows for how much longer. She is about 3-4 months old, and is continuing to grow. It is quite funny watching her go through it and get high centered. Katy is slowly warming up to her and starting to play with her. I hope they become best friends and that Gracie Lou will help with Katy's separation anxiety. Only time will tell. As for now I am going crazy with Michael and Gracie running around, but loving it. Since that day, we haven't taken her out all day long. Maybe she will come again if we are nice. The girls are loving her fantastic bracelets, games, swimming buddies and her beautiful hairdo's. Talia sat with the girls Sunday afternoon and curled all their hair. They were in Heaven with the curls!! They had to pose for photos---who knows when it will happen again? Talia left for a volleyball camp at UT in Austin and the girls are already missing her. They can't wait for her to come back and play with them. They are going to be a little lonely when she leaves. It has been fun watching Talia grow up to be a great, fun, beautiful young woman. We all love having her here and would take her any time. We hope to have her back again, with other family members too!!! Samantha and her beautiful curls. What a poser and beautiful girl. Look at that smile and hair!!!! Little, Mischievous Alex. How can you not love a face like that.